REGISTERED BRAND - HEAVY DUTY BASE: It Won't Crack Like Other Lifters - Our Design a Rubber Coated Plate on the Top Prevent Cracking (#1 Complaint Eliminated by our Design). Our Heavy Duty Design (Patent Pending) is great for Beds, Couches, Armchairs, Desks, Sofas, and more. 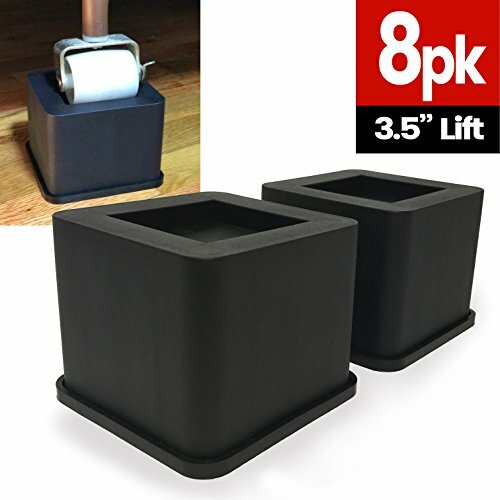 Lifts 3 inches for Stationary Items. INCREASE STORAGE UNDER BED: Increase Height and Lift Bed to Store Items - More Storage Space Instantly. Create More Storage Under Beds and Furniture. Great for robot vacuums. VERIFIED LAB TEST RESULTS: Our Design coupled with our Rubber Coated Plate (helps prevent furniture leg cracking the riser) can Support over 1,700 pounds PER LEG, or Over 6,800 POUNDS for the ENTIRE Furniture Piece. Amazing Quality! By iPrimio a Michigan Based Company. SAFE ON WOOD FLOORS: We Molded an Exclusive Rubber Bottom Mat (removable) to PROTECT your WOOD FLOORS. Also, prevents your Bed and Furniture from Sliding Across the Floor and Rolling.